There are maps and there are maps. Good ones, useful ones, silly ones, and barely useful ones. 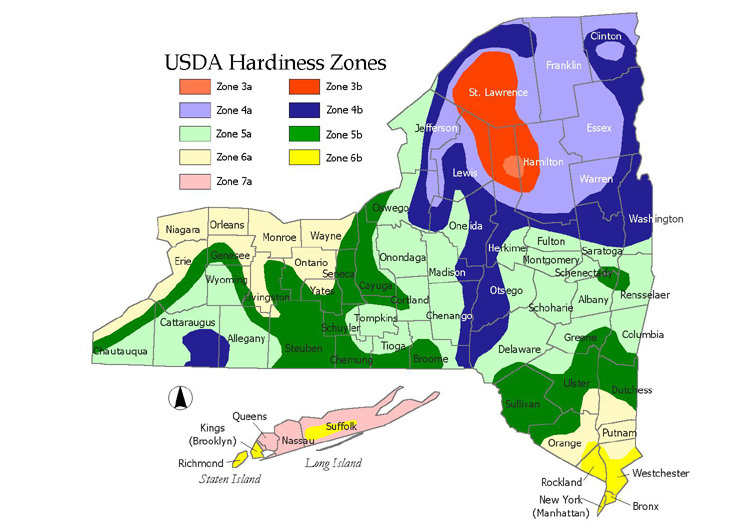 This is a brief survey of the best downloadable full maps dealing with agriculture and viticulture in New York State along with a handful that aren’t so functional. Perhaps the major and most important source of information and knowledge about viticulture in New York State is the Cornell University Agricultural Extension Program, which runs the New York State Agricultural Experiment Station based in Geneva, NY. As a land-grant school, Cornell’s College of Agriculture and Life Sciences was founded in 1874, and it is the 3rd-largest such school in the country. Over the years it has mapped nearly all aspects of agriculture in the state, including viticulture. The map above is a small-scale representation of the dominant soil types in the state. Map by Quentin Sadler of the UK for his Web blog. Copyright 2010. The two maps above are representations of the NY State American Viticultural Areas or AVAs, but neither accurately depict the Long Island AVA, which covers the entire island–what is shown actually represent a combination of the North Fork and Hamptons AVAs. 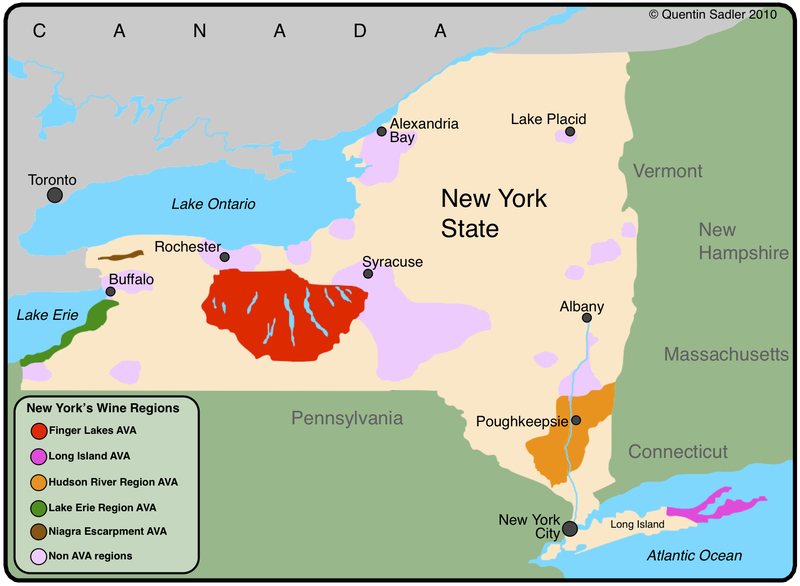 Furthermore, the two maps don’t even agree on the boundaries of the Hudson River Region AVA. 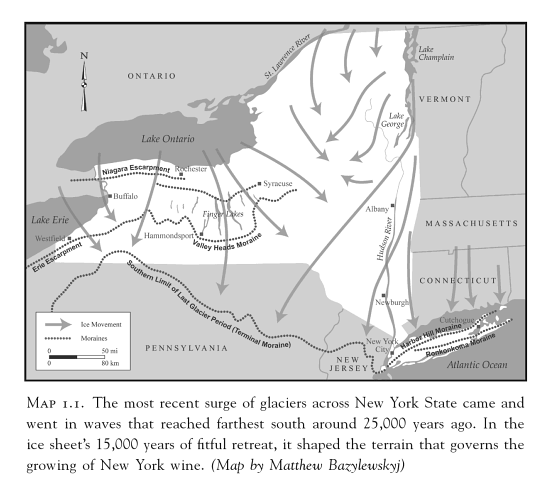 The top map (NewYorkWines.org) is the more accurate one. 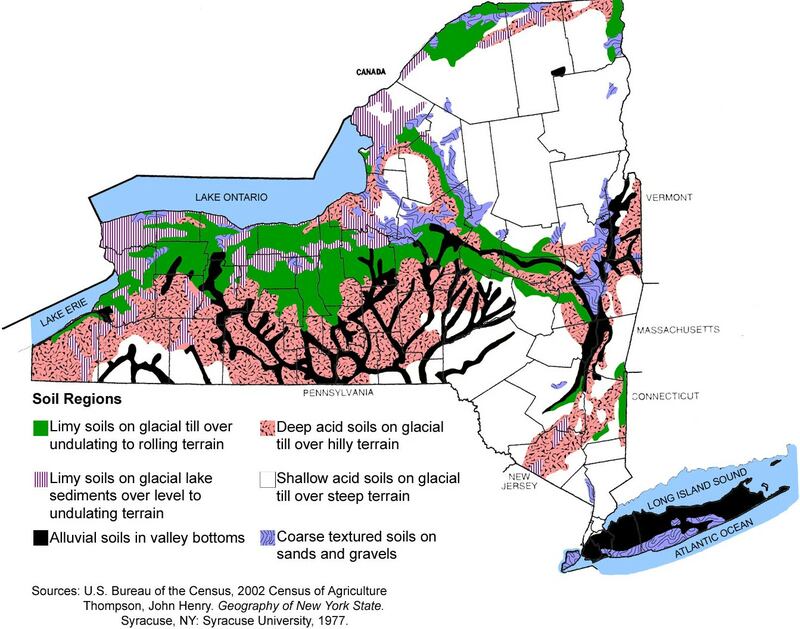 It actually follows the contours of the AVA described in the TTB Code of Federal Regulation (GPO Title 27, Part 9, Subpart C: Approved AVAs-Hudson River Region). However, while the top map shows the Lake Champlain Region, the bottom one does not, and there is no indication that Lake Champlain is now a proposed AVA with approval pending from the TTB (short for Alcohol and Tobacco Trade and Taxation Bureau, an agency of the U.S. Treasury Department). 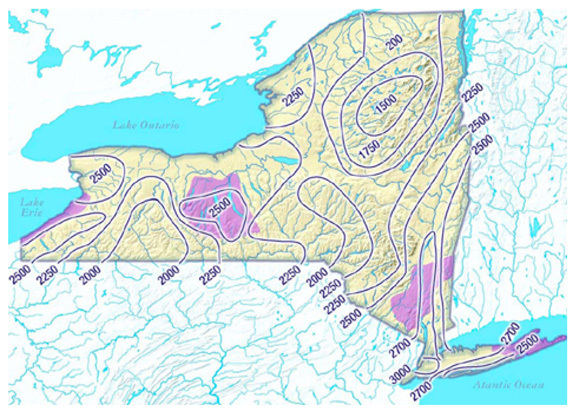 The Wines & Vines review offers a good explanation of what the site evaluation maps are and how they can be used: Wines & Vines Review of NY State Vineyard Site Evaluation Website. Also read this critical piece about it from the New York Cork Report. 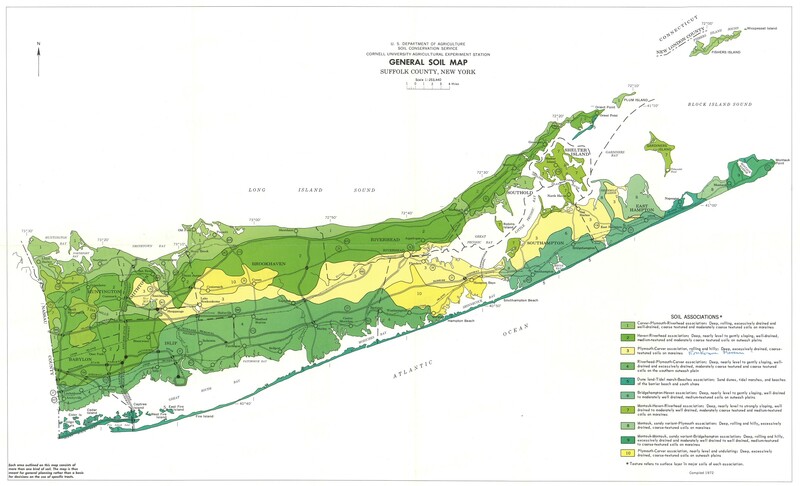 A problem with this particular precipitation map is that there are large areas depicted in yellow, such as most of Long Island, but the legend does not depict the rainfall amount for that color at all. A strange lacuna. 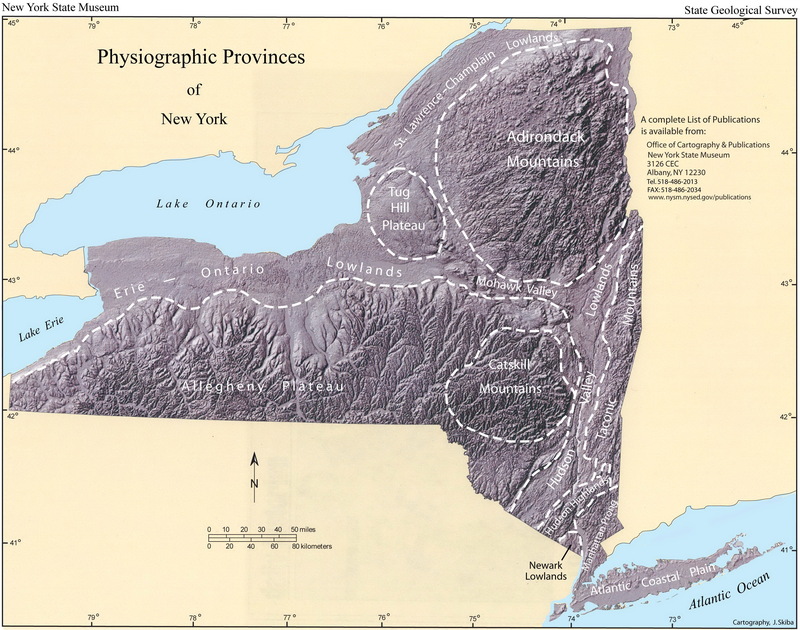 From the map above we learn that the Finger Lakes belong in the Allegheny Plateau Geological Province, while all of Long Island is uniquely the Atlantic Coastal Plain. The Hudson Valley includes two Provinces: The Highlands and Lowlands, both of which extend southward into New Jersey–but off the map boundaries. At this small a scale, a great deal of information for specific regions is not visible at all. 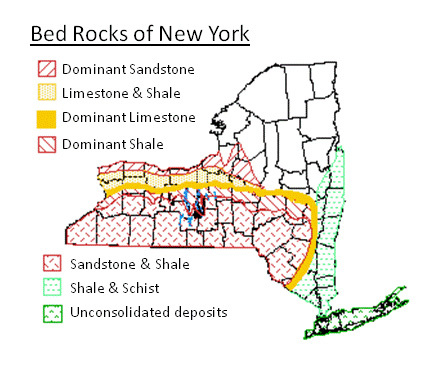 For example, the map shows a pattern of deep acid and limy soils running from the southeastern part of the state to the border with New Jersey. 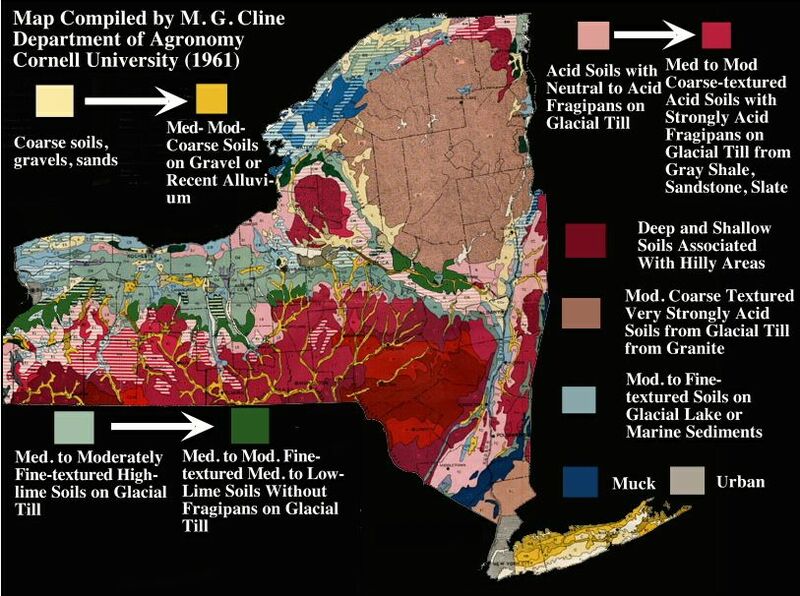 Were this to extend the soil region into New Jersey it would show its origin in Bergen County. More than that, at a larger scale it would show that there is a run of alluvial soil stretching from Bergen County on a northeasterly direction that is associated with the Wallkill River, which eventually debouches into the Hudson River. However, as detailed as this map may appear to be, there is a caveat as to its use in the lower left corner: “Each area outlined on this map consists of more than one kind of soil. The map is thus meant for general planning rather than a basis for decision on the use of specific tracts.” This particular map is used by the author in his post: Viniculture in LI: the Background. The great frustration for anyone seeking an equivalent large-scale map of other wine regions of the State is the difficulty of finding them online. In fact, the map above was scanned from a printed version and posted on line independent of the entities that produced it. Apparently these maps can only be purchased from the USDA, but a Google search yields nothing to that effect. 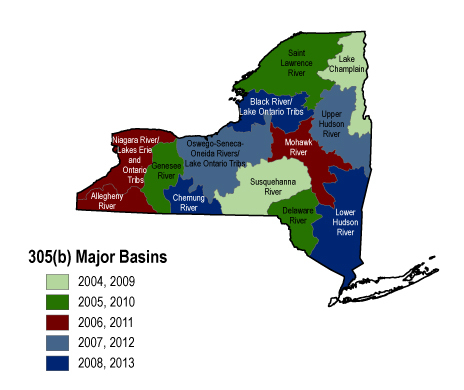 This entry was posted in Vineyards and tagged New York AVAs, New York State Vineyard Site Evaluation, New York State wine maps, New York vineyards, NY AVAs, NY State soil types, NY State wine maps, NY vineyard site evaluation, NY vineyards, NY wine maps on 7 February 2014 by JoseM-L. I have recently discovered your blog and have been reading it with interest. The links to the maps of the physiographic and low temperature extremes seem to be broken. 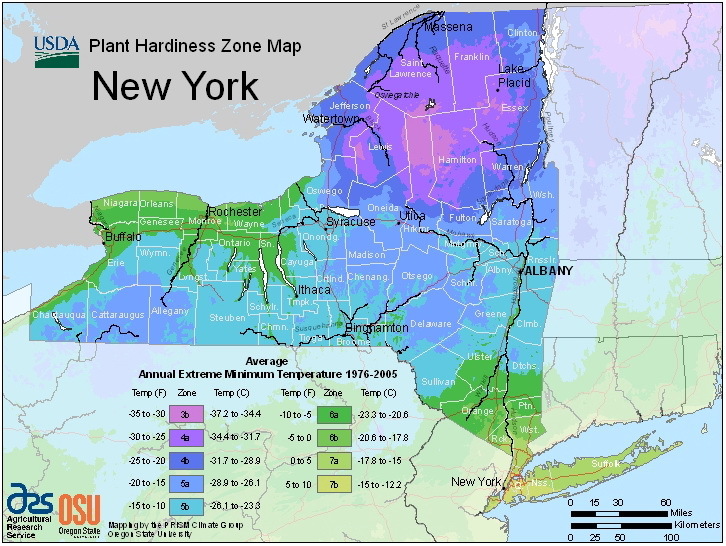 The low temperature extreme is the key to the economic viability of growing grapes, particularly vinifera varieties, in New York State. My comments on the NY Vineyard Site Evaluation tool have been previously published at the following link. Nothing seems to have been fixed in the five or six years since I first wrote IAGT and pointed out these deficiencies — instead, they shut down parts of the application. I view this tool as useless in its current elaboration. It’s time they released the underlying data and let us do our own GIS analysis with it. John, first let me thank you for pointing out the broken map links; they are now repaired. Your observations about the HRR AVA are well taken, for I too find the contours mysterious and in need of revision. I don’t know that the 2700 contour is optimum, perhaps even 2600 would be acceptable, though it’s not shown on the geocaching map. There certainly is some misleading blarney in the Wine Course, but as you fairly point out, it is promotional, not just educational. I thank you as well for the link to Lenn Thompson’s very useful post. I’m going to add that link right into the post.